When the Cathedral of St. John the Divine began construction in 1892 at Amsterdam avenue and West 110th Street, the city believed that the occasion required a grand, wide boulevard to approach it from the east and west in addition to Amsterdam Avenue, which received its own name just two years before when the numbered avenues west of Central Park and north of West 59th Street received historic names in a burst of civic pride (9th became Columbus, 10th received Amsterdam and 11th settled for West End). And thus, 110th Street west of Central Park became a much wider street and gained another name: Cathedral Parkway. Cathedral Parkway, it seems, was destined to a fate matching Avenue of the Americas, a grand name ignored by New Yorkers, who went merrily along and continued to call the streets 6th Avenue and 110th Street, respectively. 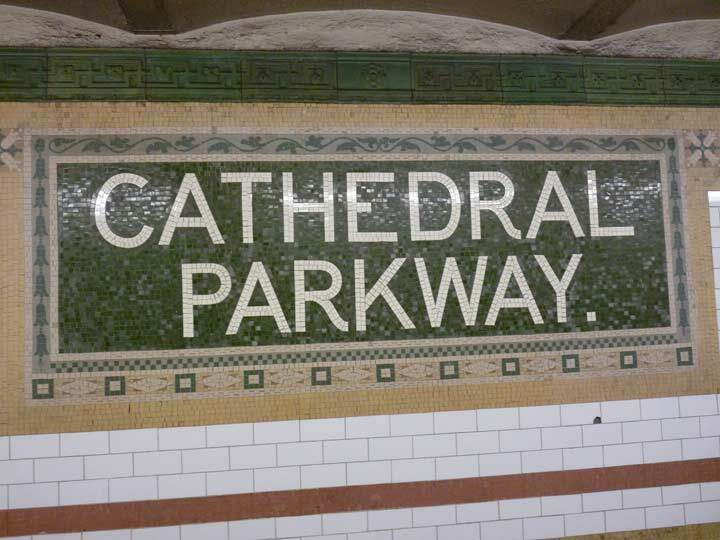 However, when the IRT subway, the city’s first, reached 110th Street as one of the Original 28 stations opened on October 27th, 1904, it was still hoped that Cathedral Parkway would be the accepted moniker and so, huge name panels were designed by Heins & LaFarge to reflect this desire. The custom of the Beaux Arts era was, add more decoration after it seems you’ve added enough, and so the station panels from 1904 are incredibly intricate works, with thousands of mosaic pieces, here rendered in brown, yellow, green, blue and beige, which my pal Phil Copp describes as viridian, ochre, rose and other fanciful color names in his indispensable guide to subway decor, Silver Connections. This is one of the few 2-line station ID tablets in the Original 28 and is impressively massive. Note that the green mosaic tiles in the main background are not all the same shade; some are lighter. That scattering of lighter tiles gives an even greater sheen to the panel in addition to what the fluorescent lamps give it (remember the stations were originally lit by incandescent bulbs, which weren’t that old an invention in 1904). Copp adds an insight: when the station was first being designed, there was a saloon, ah, music venue called Philip Dietrich’s Lion Palace of Music upstairs on Broadway, and a subcontractor named John Shields floated the idea of the station decoration to include murals of beer steins. This would have been an intriguing key to the area’s past had they been included, but perhaps owning up to a sense of propriety H & F went with the Cathedral Parkway panels instead. However, there’s at least one panel that doesn’t have the Period of Importance. (The white lettering is a bit thicker, too.) This either indicates that it was installed some time after the originals were, or perhaps a different contractor was used. Or, perhaps the Period of Importance was removed during a renovation. The street’s original number isn’t forgotten. It’s emblazoned in terra cotta cartouche panels along the platform rooves, once again in the station color scheme of green, buff and blue. Two tulips flank the number in honor of NYC’s Dutch heritage, a practice also carried out at other of the Original 28. The swastikas in the panels surrounding the cartouche were innocent symbols of good luck in 1904, as they still are in many worldwide cultures in the 21st Century. Isn’t the Broadway IRT the # 1 line, not the “2 line”? I used to get off there every day to do an internship with sportswriter Stan Fischler, so this entry brought back a lot of memories. That station is extremely impressive, but the northbound side had only one staircase to the street — typical of the small construction of the original 28 stations. At Broadway, opened October 27, 1904, as indicated in this posting, Cathedral Parkway is used with 110th Street as its secondary name. 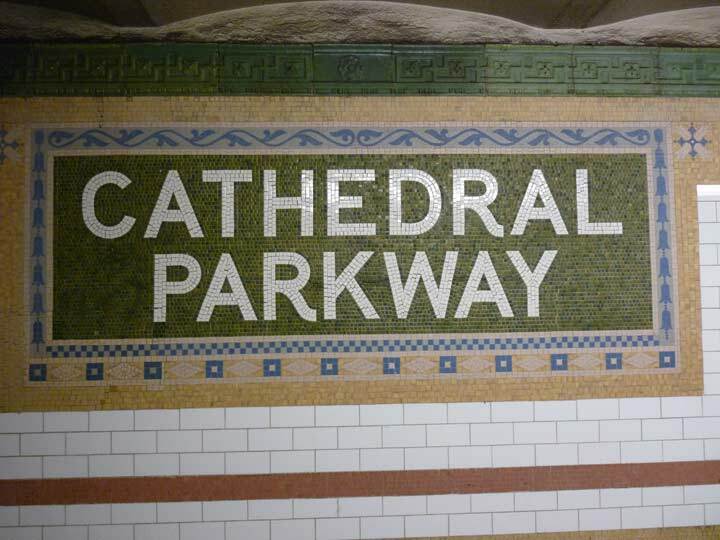 At Eighth Avenue/Central Park West, opened September 10, 1932, name tablets say 110th Street – Cathedral P’kway. At Lenox Avenue, opened November 23, 1904, less than a month after its sister station at Broadway, the original name was simply 110th Street. 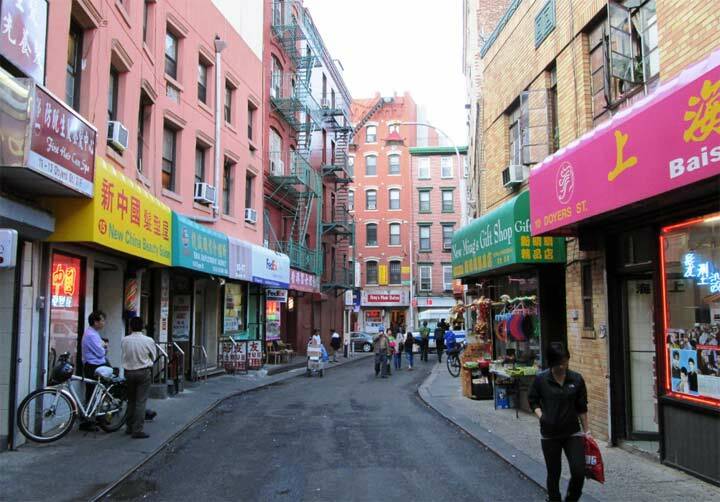 Today it’s called 110th Street – Central Park North to reflect a secondary street name adapted about fifty years ago. 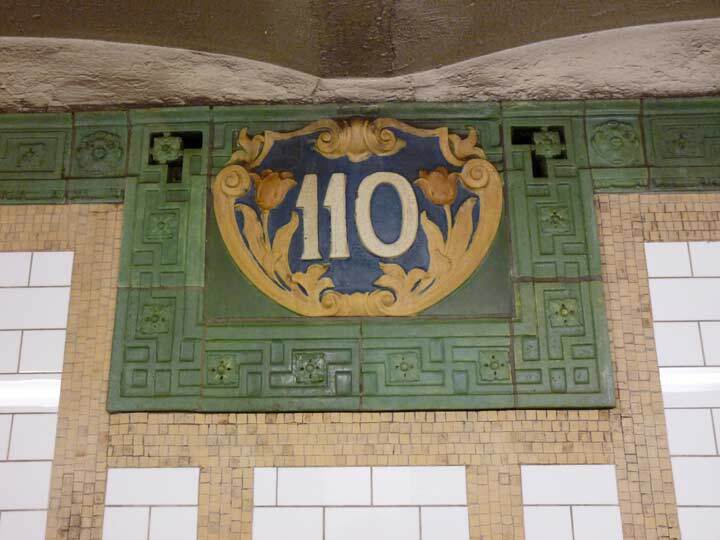 At Lexington Avenue, opened July 17, 1918, it’s simply 110th Street. At one time three old elevated lines also ran north-south in this area, but only one had a station at 110th Street Station – without an additional name. It was on the 9th Avenue Line, and featured an unusually high station there because of the west-to-east downward dip on 110th Street at that point. It was directly above the subway station at Eighth Avenue/Central Park West. The 2nd Avenue El had stations at 105th and 111th Streets; the 3rd Avenue El, Manhattan’s last, had stations at 106th and 116th Streets. In my humble opion, the station at Lenox Ave & 110 on the 2&3 lines was given the moniker Central Park North due to gentrification in Harlem. Conversely, 59th Street, on the southern end of the park has been long call Central Park South due to the area’s affluence. The west side of the park is called Central Park West, not 8th Avenue, also due to its affluence. Affluence has been on the rise on 110th Street, err, Central Park North for quite a few years. If you don’t believe it, take a trip up to Harlem and check out what they’re asking for in rent and home prices. After all the name Central Park NORTH has more cachet than 10th Street. Just keepin’ it real. @Gary, I think 110th street between 8th and 5th ave has been known as Central Park North at least since the 70’s and certainly back then it was not gentrified. And as for 5th avenue, it is not know as Central Park East. Perhaps you are right that the station name itself only changed recently after the current gentrification. Central Park North was officially adapted Sept. 6, 1965, as a moniker for W. 110th Street between Fifth and Eighth Avenues (from The NY Times, Sept. 7, 1965). To be obsessive– and why not?– I will observe that there are three different styles of name tablet in the station. The one you don’t show is similar to the one with the Period of Importance but is immediately distinguishable by not having the Dot of Termination. It is a very rare lapse on Phil Copp’s part that he did not observe this. Someone else with way too much free time should photograph all of the tablets and let us know whether there are even more than three styles.